We’d love your help. Let us know what’s wrong with this preview of What's Language Got to Do with It? by Keith Walters. This is just some of what you ll find in What s Language Got to Do with It?, a thought-provoking new reader that introduces some of the most important language issues facing us today and prompts students to think hard about their own use of language." 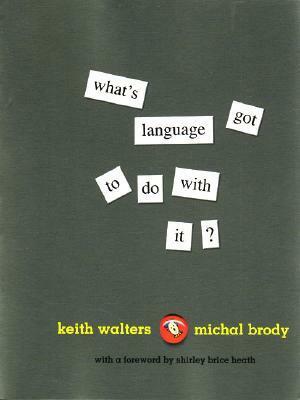 To ask other readers questions about What's Language Got to Do with It?, please sign up. Be the first to ask a question about What's Language Got to Do with It? This is the most comprehensive text I have found about the Native speakers and new users of the American English Language, and what part everyone has played in developing it from where it was in 1910 or so to the present. A fabulous work! Buy this book! Read it for pleasure, keep it for reference. Probably intended as a text book, I highly recommend it for fun! It is like a deep well of cool water one dips into again and again. I read this originally when I TAed for Poitevin at Millikin. I started revisiting it, thinking I might be able to use some of the articles, but they're just getting much too dated. I need to find something newer. No need to waste my time continuing to re-read this one.